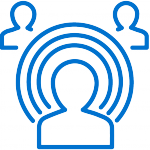 At Percepta, we understand that for any marketing campaign to be successful there needs to be a support team in the background to make sure customers are given the information they need and are offered help throughout the sales process. Across the globe, our expertise covers all aspects of this marketing support; from reaching out to customers following a brand campaign, to setting up dedicated teams to answer customer enquiries. Regardless of the size of the campaign or the number of targeted customers, we have the skill and understanding to deliver, hit and exceed the Client’s target. For our automotive Client in the USA, we were tasked with boosting the number of test drives and sales of two of their newest models, following the launch of a campaign mailer. They targeted us with making 157,000 dials to customers, and scheduling 2000 test drives within a period of three months. For this project, we brought in a team of customer experts, equipped with both sales and customer service experience, dedicated to calling customers, sharing the benefits and exciting features of the new vehicles and booking test drives. Over the campaign period, the team reached over 100% of target customer calls, and scheduled more than 300% of our Client’s test drive target! 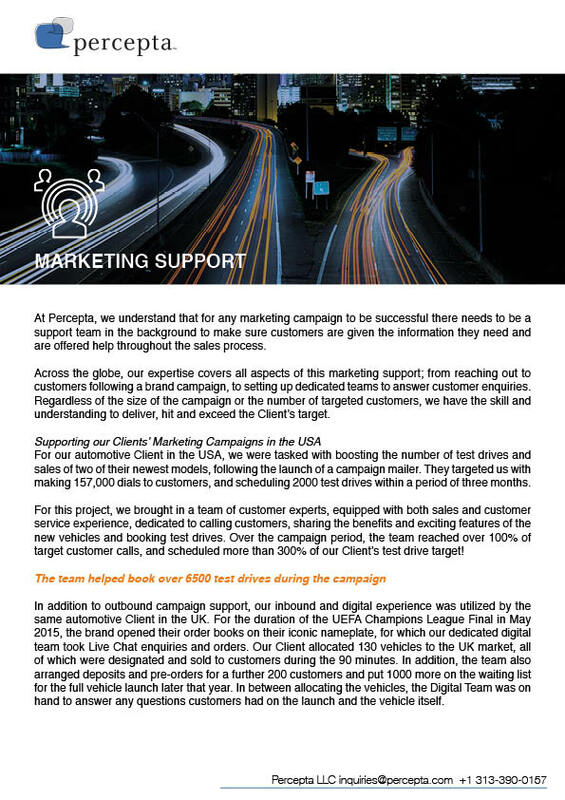 In addition to outbound campaign support, our inbound and digital experience was utilized by the same automotive Client in the UK. For the duration of the UEFA Champions League Final in May 2015, the brand opened their order books on their iconic nameplate, for which our dedicated digital team took Live Chat enquiries and orders. Our Client allocated 130 vehicles to the UK market, all of which were designated and sold to customers during the 90 minutes. In addition, the team also arranged deposits and pre-orders for a further 200 customers and put 1000 more on the waiting list for the full vehicle launch later that year. In between allocating the vehicles, the Digital Team was on hand to answer any questions customers had on the launch and the vehicle itself. Due to the success of the campaign, we were also given the responsibility of managing all pre-orders, reaching out to these VIP customers with updates on the progress of their newly purchased vehicle. For both campaigns, our support was seen by the Client as invaluable to a successful outcome. Our ability to set up dedicated teams quickly to respond to our Clients’ brief sets us apart from the competition and ensures that we continue to deliver excellence at this vital stage of the customer journey.